Few infantry officers understand how to manage sustained close combat operations like those found in urban environments and dense terrain where progress is measured by meters a day. This heavily favors defense since ambushes and booby traps are easy to employ. Advances are slow to minimize casualties since few armies are willing to employ suicidal "banzi" charges. The most effective method is for grunts to dash forward a few meters at a time while others provide cover fire and attempt to locate enemy shooters. Infantry leaders instinctively employ all their forces into the attack hoping to overwhelm an enemy. However, locating and destroying an entrenched and concealed enemy requires patience, especially if they move about within buildings, tunnels and sewers. Infantry officers must accept this constraint and understand that infantrymen no longer advance after 48 hours of close combat due to fatigue and a lack of decent food, sleep, and sanitation. In addition, heavy casualties convince survivors that death is imminent since fighting never ends. This is rarely understood because peacetime urban warfare and assault course training lasts just a few hours. In addition, sustained close combat is quite different from open warfare where units maneuver and rest between battles. As a result, the US Army encountered difficulties during World War II in close terrain like cities and forests where offensives stalled because frontline soldiers were left in close combat for days. 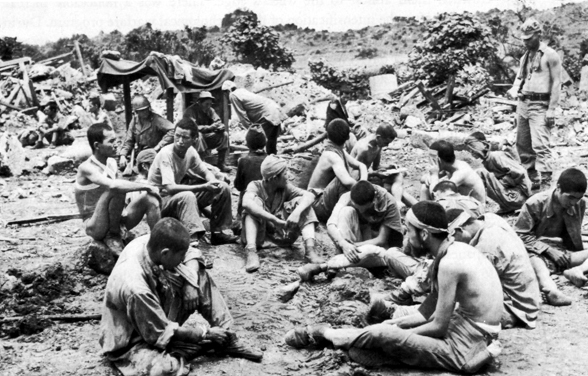 Mental casualties became as common as physical injuries and most grunts eventually stumbled to the rear. They were replaced by new grunts who arrived to find a mixture of other confused green troops and veterans in near shock, known as the "thousand yard stare." The Army eventually pulled units out of the line to regroup, but most divisions never developed a method of maintaining a grinding offensive momentum. In the Pacific, US Marine Corps assaults into island fortifications taught them to develop a rotational system. The basic model is the infantry battalion square; two companies forward, two behind them, with the battalion headquarters and support elements in the middle. Two rifle companies fight and advance for 48 hours, then the two rear companies move forward to relieve them in place. The two fatigued companies move to the rear to eat hot chow, "use" toilet paper, receive medical care for minor injuries, hopefully get a few beers, then sleep. The next day its more hot chow, weapons cleaning, bathing and more sleep. These rearward companies also provide the battalion with defense-in-depth should the enemy mount a counterattack and punch through a forward company. Since these companies return to their approximate areas, they are familiar with the battlefield and this break allows planning for the upcoming 48-hour combat phase. Replacements can be added and broken or lost equipment replaced. As they move back into the line they are refreshed and fully equipped to fight, with the comfort of knowing they will be pulled back after 48 hours. This rotational arrangement allowed Marine Corps infantry battalions to conduct sustained offensive close combat operations for weeks, as was needed during several island battles. Attached supporting elements rotated with rifle companies or as directed by the battalion staff. The Japanese had no rotational system so defenders became exhausted and either surrendered (left), killed themselves, or got liquored up for a suicidal banzai charge. They could have held their defensive positions much longer and inflicted heavier casualties if rest were possible. However, they became demoralized and suffered mental breakdowns as Marine companies "tag teamed" and attacked at all hours with refreshed troops. Since battles are fluid it is difficult for infantry commanders to accept that their offensive has slowed into a close combat grind. They must recognize when battalions should form an infantry battalion square before their grunts stop completely. This is not only good for combat success but for morale as well. Tired, hungry and dirty soldiers cannot advance against strong enemy defenses. The infantry square is not really a tactic, just common sense.